MMU launches its first Grants Academy! Applications are now open for the first MMU Grants Academy! What is the Grants Academy? The Grants Academy is an intensive 6-week programme designed to teach applicants more about how to submit successful grant applications to UK Research Councils and other prestigious research funding agencies, as well as increasing the likelihood of a successful applications through support and guidance throughout the bid writing process. Armed with everything they need to submit a bid, participants will submit a completed bid within the following 9-12 months. Applicants must be able to attend the entirety of the course and a second cohort should take place in Spring Term 2015. This course is aimed at academic staff at MMU for those who feel they could learn more about writing proposals. They should have an idea of a project that requires funding. They should be committed to writing a successful grant proposal and are able to dedicate the time needed to complete the programme. Categories: Uncategorized | Tags: Bid writing, Grants Academy, Research Development, Training | Permalink. Horizon 2020 Advisory Groups are starting to share their thoughts on priorities for 2016 and 2017, giving us an insight into potential future calls. A number of the Advisory Groups, which bring together experts from different disciplines, have published their views on the key challenges that need to be addressed and what activities will help Europe to overcome these challenges. The Health Advisory Group has identified and analysed eight main strategic priorities in its report. These are: Ageing at large; Personalized medicine; ICT for health; Population health and health promotion; Infectious diseases; Early development; Sustainable health and care systems and Environment and health. The Transport Advisory Group has identified eleven priorities, which include: Urban transport; Climate change, air pollution and noise mitigation; Demographic trends; Harnessing ICT and data management; Managing uncertainty and risk; Resilience to extreme weather; Reducing loss of life and adverse health effects; Alternative fuel sources; Competitiveness; Innovating infrastructure maintenance; and Maximising resource utilisation across the sector. The report from the Climate Action Advisory Group highlights four priority areas. These are: Systemic Eco-innovation; Climate Services; Nature-based solutions; and Sustainable Supply of Raw Materials. The group also identifies a number of cross cutting issues touching on health, migration, geopolitics and cultural heritage. The Advisory Group has recommended five Thematic Priorities: Understanding Europe; Promoting a collaborative, creative and sustainable economy; Building and open, engaging and innovative public sector; Facing the turbulence of regional and global change; and Overcoming inequalities by developing Europe’s human and social enterprises. The Secure Societies Advisory Group highlights five areas of strategic focus: Planning and integrating advances across technical areas or missions, Social Dimension of Society, Crime and Crime Prevention, Data Protection, Resilience and Privacy and Cross-Cutting Capabilities and Issues. It also recommends investment in ‘Innovation Roadmapping’ in each of the areas. The MSCA Advisory Group identifies the MSCAs as the flagship programme for research training in Europe and is keen to uphold a number of its principles regarding inclusiveness and increasing employability of researchers. The recommendations point to a continuing emphasis on collaboration between the academic and non-academic sectors, with some suggestion of specific funding calls to encourage engagement of the non-academic sector (including SMEs). There are also suggestions that the international dimension should be strengthened, particularly in relation to the MINT (Mexico, Indonesia, Nigeria and Turkey) and BRIC (Brazil, Russia, India and China) countries. Planning is one of the keys to success in Horizon 2020, so we’d encourage you to take a look at reports in your area to get a head start for future calls! If you’re interested in getting involved in Horizon 2020 and would like to know more do get in touch (euro_res@mmu.ac.uk) and don’t forget to sign up to our UKRO event on 12 September to find out more about the Marie Skłodowska Curie Actions. Categories: Funder Intelligence and Policy, Horizon 2020 | Tags: Climate Action, European, European Commission, European Union, Health, Horizon 2020, Marie Skłodowska-Curie Actions, Research, Security, society, transport | Permalink. Be kept in the loop with European Funding, news and insights by signing up to the UKRO Portal. The UKRO Portal is a useful source of information for anyone interested in EU funding including Horizon 2020. Once you have signed-up you can create a profile, receive updates and news about specific research and policy areas of interest as well as search for articles. Categories: Funder Intelligence and Policy, Funding Opportunities, Guidance, Horizon 2020 | Tags: Europe, Funding, Horizon 2020, UKRO | Permalink. Ian will also be running a number of special interest sessions at The University of Manchester on Thursday 11th September and our colleagues have kindly opened up the invitation to MMU staff. The day will include sessions on gender, ethics, open access and research data management, and evaluation, and you can attend as many or a few sessions as you like. If you would like to attend please email us at euro_res@mmu.ac.uk and we will arrange registration. Categories: Events, Funder Intelligence and Policy, Funding Opportunities, Guidance, Horizon 2020, News | Tags: Europe, Event, Funding, Horizon 2020, UKRO | Permalink. ESRC are now inviting proposals for Civil Society Data Partnership projects under Phase 3 of the Big Data Network. The Big Data Network, funded largely through capital investment from the Department for Business, Innovation and Skills, is supporting innovative centres and other projects which are facilitating access to and analysis of different types of data, enabling internationally-leading research which addresses both key social science research questions and the challenges faced by data owners. The Civil Society Data Partnership projects will establish or build on relationships between academic researchers and civil society organisations to demonstrate the value of improved data infrastructure, enabling collection and analysis of data which is of interest to civil society organisations and through enabling the sector to better utilise its own data. In the context of this call, by ‘civil society’ they mean any charitable or voluntary group or organisation, including benevolent societies, trusts, foundations, housing associations and other philanthropic organisations. This grant is capital funding so they are not looking to fund collaborative research. Rather, they require that projects provide facilities, services and other support for data access and linkage, including purchase of datasets as appropriate, and with the aim of facilitating research that will result in the development of a resource which could have broader application and be of use to the wider community. Example 1: An umbrella body may partner with an academic institution or other RO to submit a proposal for the development and implementation of an agreement for standardised data collection. Such a project might also involve changing submission processes to ensure that data is subsequently available for research use. Example 2: A charity working with a section of the population nationally or internationally (eg children, vulnerable adults, homeless people) may partner with an academic institution or RO to gain access to and develop methods to analyse data which can help them improve their policies and practices. Such data might include, for example, centrally held administrative data, local government data, in-depth case study data or survey data. Example 3: An umbrella body may partner with the NCRM, academic institution, or other RO to co-develop an openly accessible training toolkit which enables civil society organisations to better utilise data (eg methodologies, data analytics, data visualisation). Example 4: An in-scope civil society organisation with physical qualitative or quantitative data (including paper records and other texts, images, video and audio) which it would like to be preserved, archived and made accessible for research use may partner with an academic institution or RO, such as the UK Data Service, in order to digitise and curate the content. Example 5: A voluntary organisation may partner with an academic institution or RO in order to develop methodologies which enable the linkage of data held by the organisation with data from a cross-sectional survey (eg National Survey of Sexual Attitudes and Lifestyles, Skills and Employment Survey) or longitudinal study (eg Understanding Society, Millennium Cohort Study, Timescapes). Projects should be led by an academic Principal Investigator at an academic research organisation and all proposals must include someone from at least one civil society organisation as a non-academic co-investigator who will take a central role in the intellectual leadership of the project. Proposals are invited for a duration of up to 18 months, with the latest start date of 14 February 2015. The budget of each Civil Society Data Partnership project will be a maximum of £250,000 (100 per cent fEC). The minimum funding level is £50,000 (100 per cent fEC) and it is expected that proposals for both small and large projects will be received. 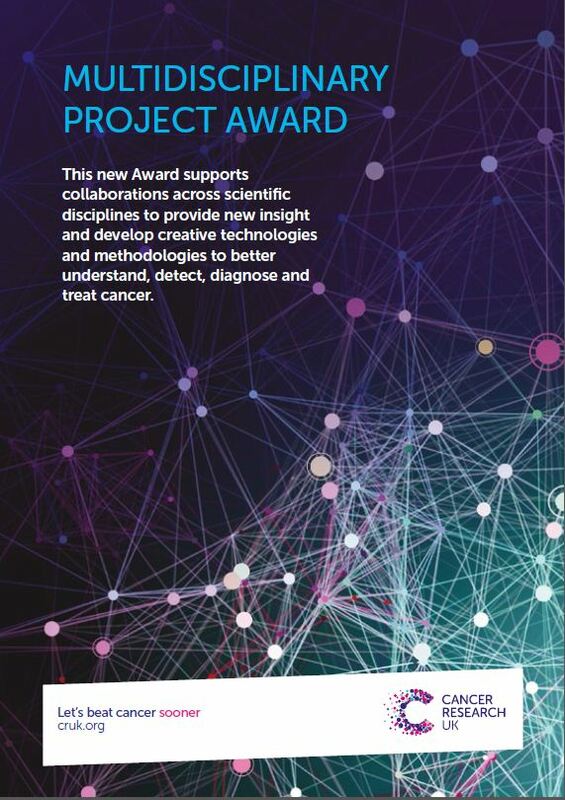 This new Award supports collaborations between cancer researchers and scientists from engineering and physical science disciplines to provide new insight and develop creative technologies and methodologies to further understand, detect, diagnose and treat cancer. CRUK want to target both cancer researchers and those working in wider research fields such as engineers, physicists and chemists. This new Award supports immunologists working in non-cancer fields to bring their expertise and insight to cancer research, to deepen our understanding of the role of the immune system and its interaction with tumours. 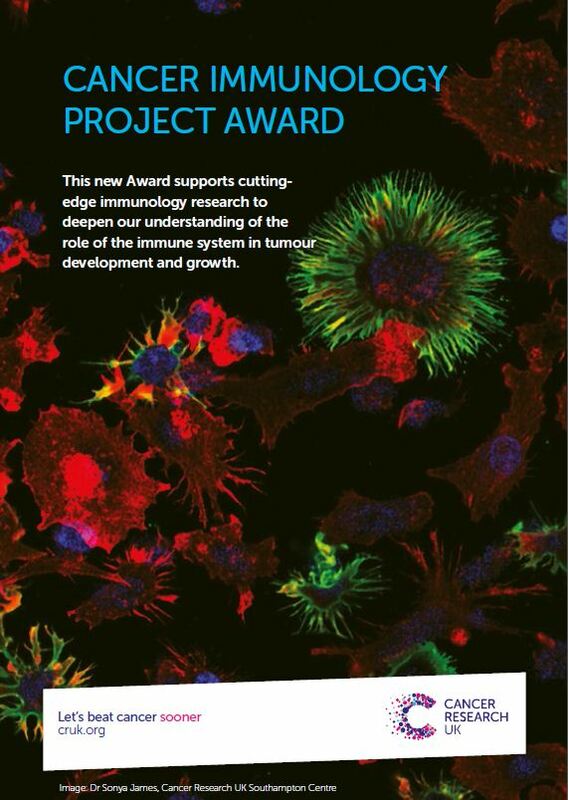 CRUK want to promote this to immunologists in non-cancer fields. Categories: Funding Opportunities | Tags: Engineering, Funding, Health, Interdisciplinary | Permalink. The British Council’s UK-India education and research initiative invites applications for their thematic partnerships. These facilitate collaborations between faculties and researchers and enable registered PhD students and postdoctoral researchers in India and the UK to undertake short-term visits to work on research projects. Multidisciplinary research is encouraged. These partnerships are intended for institution-based research teams, in the UK and India, of proven research ability. The project leaders should be faculty members or researchers in an institution or research laboratory in a UK university or institution. EU citizens may apply provided that they hold a permanent position in the UK, and non-EU citizens should have held a permanent position at a UK institution for at least three consecutive years. Indian project leaders should be based in an Indian university or institution and be resident in India. Funds are available for partnerships of up to 15 months in duration and provide a maximum of £40,000 equivalent in Indian rupees. Categories: Funding Opportunities | Tags: India | Permalink.